Most women know their own individual system through and through, and so are fully aware of when they can expect a period, how light or heavy it will be, and how long it might last. Because of this, when there are interruptions to the norm, this can understandably lead to concern. Irregular periods can not only be a nuisance, but they also sometimes produce undesirable effects, including psychological and physical effects. Irregular periods can have a number of different causes, but possibly the most well-known reason for late periods is pregnancy. It is, therefore, natural for women who are late or skip a period to suspect they are pregnant, which can cause considerable worry among those that did not plan for pregnancy. Having to endure erratic periods can be extremely difficult, causing some women to become particularly irritable. This might be the case especially if an unexpected period occurs and interrupts your plans. Similarly, sometimes bleeding might begin when a woman is not prepared with sanitary items such as tampons and pads. This could lead to leaks which might prove embarrassing. 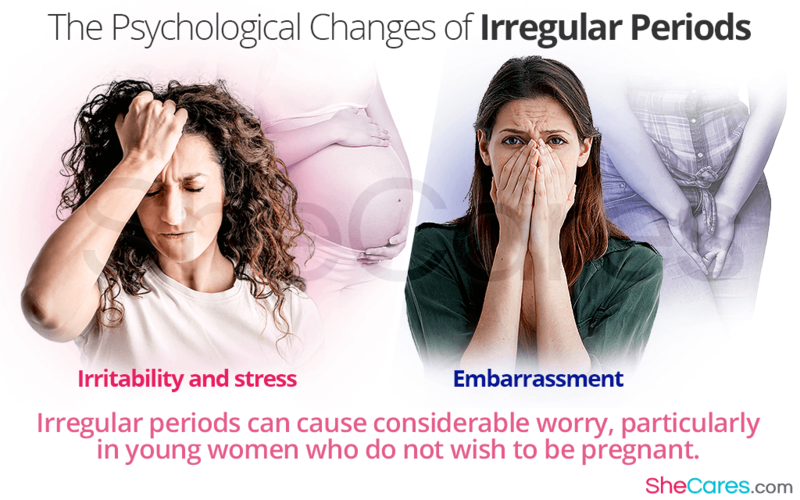 To avoid these psychological aspects, it is advisable to become thoroughly aware of the potential reasons behind irregular periods, and acknowledge that they are a possibility. This should allow you to become more prepared when the condition ever present itself. The amount of time between each period can differ from woman to woman, being generally anything between 21 -35 days. While it is normal for this time to increase or decrease by a couple of days each month, irregular periods can mean the time changes by a week or more. On average women lose about two tablespoons (30ml) of blood per period. Again, women are all different; however, and anything up to 80ml is considered safe and normal. Irregular periods can cause the amount of flow to fluctuate, seeming excessively minimal to excessively abundant in some cases. Most periods tend to last for between 3 - 5 days. Irregular periods might lead to a very short period - possibly even just one day of bleeding - or alternatively they could mean bleeding for a week or more. Irregular periods, especially during perimenopause can be burdensome, commonly leading to some worry and distress in many women who are affronted with them. Armed with some knowledge about the causes and symptoms, it should be possible to face this problem and help women with their effects.